Silloway Gymnasium is about to get loud, folks. Basketball season has returned, and for the men’s team, that means a chance at returning to the NCAA Tournament for the fourth time in the past six years. Building off of last year’s fantastic season, the Cardinals are ready to ready to fight for more NCAA Tournament wins. Last year, the Birds won their first-ever tournament game against Southern Vermont College by a convincing score of 101-71. This year, the Cardinals have even more momentum, and here’s why. The team is only losing two players from last season, Jordan Sears ’18 and Nathan Krill ’18. Though they were big contributors late in the season, especially Krill who made an incredible last second shot to beat Amherst, the future is bright. Incredibly bright. Captains Jordan Bonner ’19 and JR Bascom ’18 GR ’19 will lead the team. Both played critical roles last season with Bonner flying around on the wing and Bascom controlling the paint. In addition, last year’s NESCAC Freshman of the Year, Austin Hutcherson ’21, returns. Shooting over 44 percent from three-point range last season, Hutcherson’s ceiling is incredibly high, and he will serve as key player for the Cards. Although there are many great players returning, we can’t forget the force behind it all. Head coach Joe Reilly returns for his 11th year with the program. 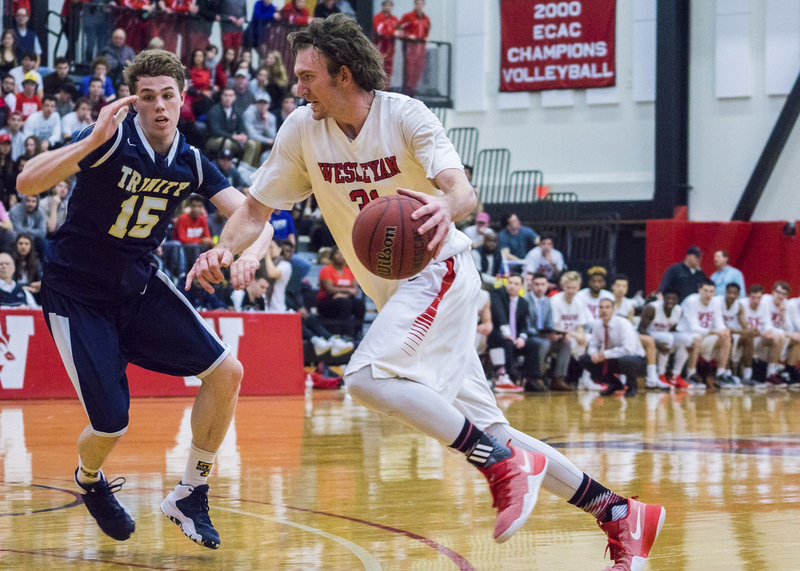 Reilly has had unprecedented success at Wesleyan, as he has taken the Cards to three NCAA Tournaments in the past four years. And in keeping up his tradition of success, he is preparing the team well for this upcoming season. According to the players, Reilly is really hammering home conditioning this year. And that Herb Kenny Tournament opens up the season for the Red and Black. It takes place this upcoming weekend, Nov. 16 and 17, Friday and Saturday. In talking about the Cardinals and their success last year, it is impossible not to mention the roles played by last season’s impressive first years. Alongside Hutcherson are big men Jordan James ’21 and point guard Antone Walker ’21. These men appeared in all 29 games last season and will contribute even more to the team this winter. In a similar vein, the team gets along well. Basketball is a game that requires a team to play together, regardless of class or grade, and the Cardinals are confident in their ability to play together as a unit. The Cardinals are looking forward to the Herb Kenny Tournament this weekend, despite the small amount of time for preparation. They know their game and how to stick to it even as the long season goes on. As important as good starts are, the Cardinals have their eyes set on the postseason. Going further in the NCAA Tournament and/or winning the NESCAC Tournament would be huge for the program’s continued success, as the core of the team will soon be that young cast of 2021ers. Here’s to a great season for the Cards. Best of luck this winter. Ben Owen can be reached at bowen@wesleyan.edu or on Twitter @benjaminowen28.